School has been off to a slow strange start. Soon after school started, we had a major quake in Napa. Our district canceled school for students for two days while employees came in to clean up. Our school had a pipe break in our staff room. Classrooms had things on the ground. Overall, though, our school was fine. Many teachers and friends had most of their possessions fall to the floor. My husband and I were lucky. We have a couple cracks in our house but nothing dangerous. Our belongings that fell didn’t break. Some of my friends had everything in their kitchen cabinets fall to the ground. The theme was clear. We were all a little shaken, but its stuff. Thankfully we are safe. Often, when I meet people from other states, they ask about how I can live somewhere with earthquakes. Even after this one, I still would take an earthquake over tornadoes or hurricanes. I’ve lived here my entire life, and this was only the second quake I felt that did any damage. Once or twice every thirty years is the kind of odds I like. The hardest part, honestly, has been getting some sleep. My dogs seem to feel every aftershock, even when we don’t, and the stress of that has been taking its toll on them. There have been a few times in the middle of the night where our dogs were barking and nothing we did could stop them. Not so great for sleep. Tired teachers can often make for grumpy teachers so I’ve been tying to give myself as much rest as possible. I took a break from blogging until now and have so much backed up to share with you! 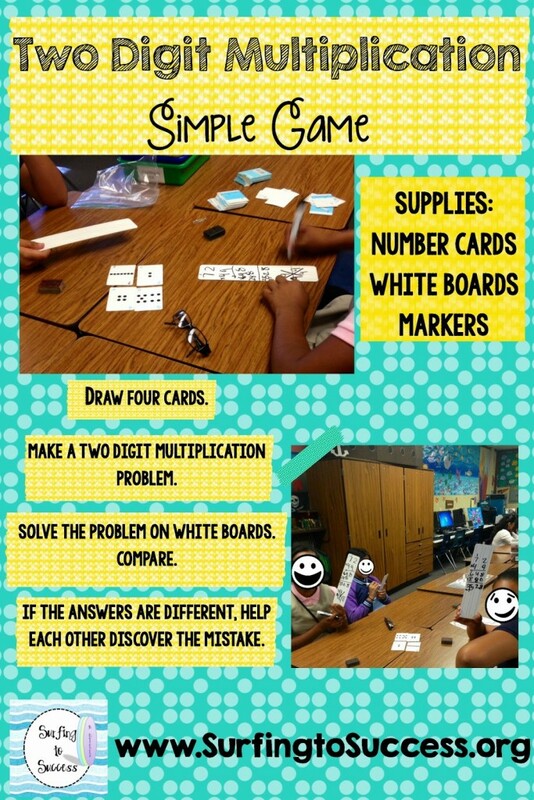 Today, I want to share with you this simple two digit multiplication game that I’ve been playing with some 5th graders that needed intervention for multi digit multiplication. Since students miss out on Art, PE or Computer Lab when they are assigned to me for Intervention, I try to make sure they enjoy it. Why multiply on a worksheet when you can play a game? I made this game up and was pleased that they loved it. One partner would draw two cards and make a two digit number. The next partner would draw two cards. They would multiply the two numbers on white boards and then compare their answer. I used white boards with penmanship lines turned sideways. This way they had lines to use to keep their digits straight. I also told them it wasn’t a race. We are focusing on accuracy- attend to precision- not speed. The wonderful part of this activity was the conversation that arose when they had different answers. Students had to figure out whether one or both of them made a mistake. I spent my time helping to guide those conversations. Of course, at first they’d look at me and ask who was right. I would guide them through the process of comparing line by line. They would find the difference between the two answer and check their multiplication. My intervention groups this week pretty much followed the same pattern for all 7 grade levels. I’d tell them their goal. They’d tell me that goal was too easy for them. I’d give them a pretest. If they got 100% they “graduated” from intervention. The ones that didn’t then realized they had room for growth and were motivated to get 100% on their next attempt. Once students have bought into their goal, they are motivated to learn which makes my job simple. 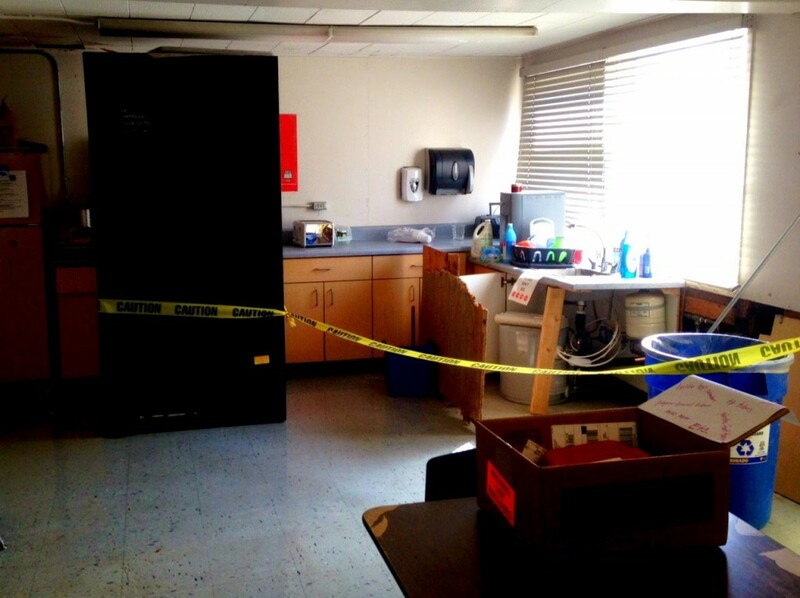 So, even though our staff room still looks like this…. … my stress level has been pretty low. I’ll keep making sure learning is fun for them, and work will be fun for me.